It’s our third year participating in the Tom’s of Maine Goodness Circle! What is the Goodness Circle? Tom’s has always maintained an “open and honest dialogue” with consumers, and the Goodness Circle is an extension of that partnership. The Goodness Circle is a “diverse group is made up of active community members, mothers, and professionals who share a passion for blogging about healthy living”1)http://blog.tomsofmaine.com/meet-our-2015-toms-of-maine-goodness-circle/. The brand story parallels that of our readers ever unfolding green lives…we are motivated by our children! We want safe products for our kids, and we want to teach them stewardship and conservation. This is exactly how Tom’s began with the same motivation of green parenting. When we joined the Goodness Circle, I was fully aware that the company was now owned by Colgate-Palmolive. I have been impressed with how Tom’s has maintained its core values and small company ethos. If you are interested in knowing more of my thoughts on the subject (including concerns about the GMA), please read Why I still use Tom’s of Maine even though they are owned by Colgate-Palmolive, written after my visit to Maine last year. In our first year, I learned about Tom’s committment to volunteerism. 5% of employee time is spent volunteering in local communities, and 10% of profits are given to “human and environmental goodness” projects. In our second year, I got to visit Maine and tour the Tom’s factory. I met employees from the factory line to management. Every employee was happy and proud to be part of the Tom’s team. Who wouldn’t be happy working for a company that provides massage therapy at work! 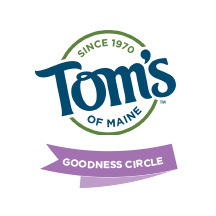 I personally decided to continue as a member of the Tom’s of Maine Goodness Circle because I believe in the quality and efficacy of the products, and I have enjoyed connecting with other Goodness Circle members. I think the company really is trying to address and adapt to consumer concerns. I have learned a lot! In my experience, Tom’s is very open and honest about their ingredients. I have seen posts circulate calling Tom’s ingredients not natural. There was even a class action lawsuit, which was settled out of court.3)http://topclassactions.com/lawsuit-settlements/open-lawsuit-settlements/177331-toms-of-maine-false-advertisement-class-action-settlement/ The ingredients in question are ones I have raised concerns about like sodium lauryl sulfate. I have found Tom’s willing to discuss these issues, including GMO labeling. When it comes to ingredients that concern consumers, Tom’s responds by offering alternative ingredient products, like SLS-free toothpaste. Even when research does not show that an ingredient has been linked to health or environmental hazards, Tom’s takes consumers concerns seriously. There are no regulations or definitions for “natural” in the personal care industry. That is not Tom’s fault. As a consumer you have to decide if naturally derived ingredients equates natural. Personally, it depends on the product and its contact with my body. I’ve always worried about the enamel on my teeth, especially as I age. Any product that is natural and promises to strength my enamel makes me happy. I love the gentle peppermint flavor that freshens breath. This toothpaste does contain fluoride, which I am not concerned about topically. Our water is thankfully not fluoridated. The fluoride is the active ingredient for enamel strengthening. It is derived from the mineral fluorspar. This toothpaste also contains sodium lauryl sulfate, which is derived from coconuts. Last year when I traveled to Maine, I had the pleasure of trying out this sensitive relief toothpaste before it became available on the market. Tom’s arranged for the Goodness Circle to enjoy a tasting menu created by Chefs Mark Gaier and Clark Frasier at M.C Perkins Cove. First we brushed with this toothpaste, then we tried the delicious foods. I have sensitivity in one of my molars. I tend to chew food on the other side of my mouth. It is especially sensitive after I have been to the dentist. My hygeniest recommended I use a toothpaste designed for sensitive teeth. The only problem with the toothpaste I tried was it did not provide rapid relief nor were you suppose to use it every day. 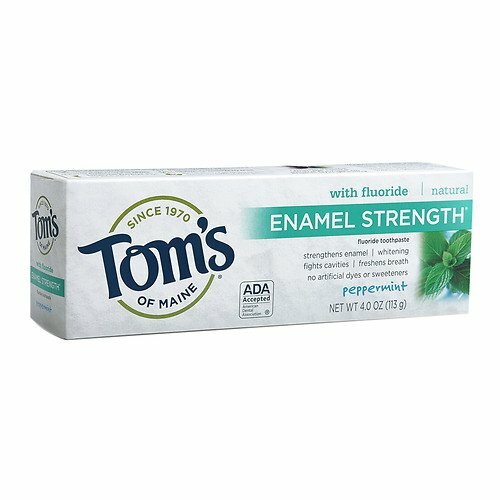 Tom’s Rapid Relief toothpaste is unique in that you can use daily. Not only does it provide relief, it actually helps to seal the nerve pathways to provide “long-lasting protection”. The active ingredients are Arginine, and amino acid, and calcium carbonate. It does contain sodium lauryl sulfate. I am very excited about this new toothpaste! I am thankful the company is offering better products to a wider audience. It doesn’t bother me that they are owned by a large corporation. It seems to be the trend of environmentally conscious brands. 4)http://www.alternet.org/story/131910/burt%27s_bees%2C_tom%27s_of_maine%2C_naked_juice%3A_your_favorite_brands_take_another_look_–_they_may_not_be_what_they_seem It’s the reason these brands are now more readily available to the general public. That is a good thing. I’ve always tried to maintain strong ethics when blogging. I try to be open and honest about my shortcomings and hypocrisy, like advocating against SLS but then recommending toothpastes that contain it. I am not perfect. Neither is Tom’s. This does not stop me from supporting the company. In fact, I find Tom’s to be a model of how to navigate the world of being owned by a large corporations and stay true to your brand’s morals. Together we can learn and promote healthy living for our families and planet. PS. My fav toothpaste is the new Botanically Fresh. LOVE! I loved seeing her too!